Uglyworld #483 - Rainy Day Solutions (122-365), originally uploaded by www.bazpics.com. Summer is a wonderful time, the sun in the sky, the birds trying their hardest to wake you up at around 5am once the sun starts to break cover way over on the horizon, and the gardens and fields awash with almost every colour imaginable thanks to the flowers and crops on display. That is unless you live in Aachen, where it unfortunately rains quite a bit, something that us humans grow used to quite quickly (hell I'm originally from Glasgow in Scotland so rain isn't exactly new to me), but for some of the smaller guys it can be quite a trying time. Take Minty Bee for example, he's been unable to get outside since around dinnertime yesterday due to the rain, it's not that he can't fly in it, he's simply scared of rain. At first I thought it was water in general in which case a 2 for 1 deal may have been possible at the local psychologist for Minty and Cinko, but I later discovered that it's only the natural, from the heavens style of water Minty will cast a dissaproving look at (and then remain inside). 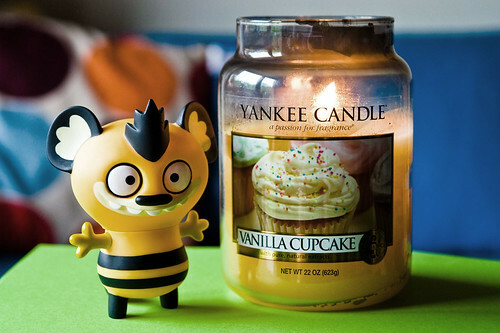 As the little guy wants to be out there smelling the awesome fragrances produced by the flowers and crops I had to come up with a plan B, so without further ado here it is, a Yankee Candle, in this case Vanilla Cupcake scented variety, which Minty simply adores. He will literally take one sniff of it's amazing odour and buzz around the room non stop for the next couple of hours. Top tip, you heard it here first!